Contents The divisions of the nervous system: central and peripheral (somatic and autonomic). The structure and function of sensory, relay and motor neurons. The process of synaptic transmission. The function of the endocrine system: glands and hormones. The fight or flight response including the role of adrenaline. Localisation of function in the brain and hemispheric lateralisation: motor, somatosensory, visual, auditory and language centres; Broca’s and Wernicke’s areas, split brain research. Plasticity and functional recovery of the brain after trauma. Ways of studying the brain: scanning techniques, including functional magnetic resonance imaging (fMRI); electroencephalogram (EEGs) and event-related potentials (ERPs); post-mortem examinations. Biological rhythms: circadian, infradian and ultradian and the difference between these rhythms. The effect of endogenous pacemakers and exogenous zeitgebers on the sleep/wake cycle. The central nervous system (CNS) is made up of the brain and spinal cord. The hindbrain (pons, medulla, cerebellum) is a continuation of the spinal cord carrying on into the bottom of the brain – the brain stem – mainly composed of sensory and motor neurons. The cerebellum controls movement and motor coordination. The forebrain is divided into 2 parts. Thalamus: concerned with relaying sensory information from the brainstem to the cortex. Hypothalamus: controls basic functions such as hunger, thirst, sexual behaviour; also controls the pituitary gland. The portion of the nervous system that is outside the brain and spinal cord. The primary function of the peripheral nervous system is to connect the brain and spinal cord to the rest of the body and the external environment. This is accomplished through nerves that carry information from sensory receptors in the eyes, ears, skin, nose and tongue, as well as stretch receptors and nociceptors in muscles, glands and other internal organs. Sensory nerve pathways bring information to the CNS from sensory receptors, dealing with touch, pain, pressure, temperature etc. The sympathetic ANS leads to increased arousal: e.g. increase in heart rate and blood pressure, pupil dilation, reduction in digestion and salivation. The parasympathetic ANS leads to decreased arousal. Sensory neurones – convey information about sensory stimuli: vision, touch, taste, etc. towards the brain. Motor neurones – convey instructions for physical operations: e.g. release of hormones from glands, muscle movement, digestion, etc. Relay neurons – connect different parts of the central nervous system (CNS). The nervous system is composed of 100 billion cells called neurons. Although different types of neurons vary in size and function they all operate in the same way – passing on messages via electrical and chemical (neurotransmitter) signals. Neurons lie adjacent to each other but are not connected. When an electrical signal reaches the axon terminals, molecules of neurotransmitters are released across the synaptic gap/synapse (the gap separating one neuron from another) and then attach to post-synaptic receptors on the adjacent neuron. This will then trigger an electrical impulse in the adjacent cell. Excitatory – make a nerve impulse more likely to be triggered: for example, dopamine or serotonin which produce states of excitement/activity in the nervous system and in our mental state/behaviour. Inhibitory - make a nerve impulse less likely to be triggered: for example, GABA calms activity in the nervous system and produces states of relaxation (as with anti-anxiety medication such as Valium). Hormones are chemical messengers secreted from structures (glands) in the body which pass through the bloodstream to cause changes in our body or behaviour. The network of glands is called the endocrine system. The pituitary gland is the master gland and controls release of hormones from many of the glands described above. The pituitary is divided into the anterior and posterior. ACTH: Stimulates release of corticosteroids during flight-flight response. Prolactin: Stimulates production of milk from mammary glands (breasts). Growth Hormone: Cell growth and multiplication. Oxytocin: Uterine contractions during childbirth . Stress is experienced when a person’s perceived environmental, social and/or physical demands exceed their perceived ability to cope. The stress response (otherwise known as the ‘fight or flight’ response) is hard-wired into our brains and represents an evolutionary adaptation designed to increase an organism’s chances of survival in life-threatening situations. The Sympathomedullary Pathway – deals with acute (short-term, immediate) stressors such as personal attack. 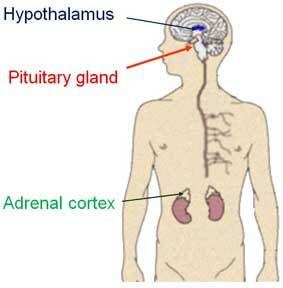 The Pituitary-Adrenal System – deals with chronic (long-term, on-going) stressors such as a stressful job. The link between brain structures and their functions (e.g. language, memory, etc.) is referred to as brain localisation. The brain is divided into 2 hemispheres – left and right. The motor cortex controls voluntary movements. Both hemispheres have a motor cortex with each side controlling muscles on the opposite side of the body (i.e. left hemisphere controls muscles on right side of body). Processing of visual information starts when light enters the eye and strikes photoreceptors on the retina at the back of the eye. Nerve impulses then travel up the optic nerve to the thalamus and are then passed on to the visual cortex in the hindbrain. The right hemisphere’s visual cortex processes visual information received by the left eye and vice-versa. The visual cortex contains different regions to do with colour, shape, movement, etc. Processing of auditory information (sound) begins in the inner ear’s cochlea where sound waves are converted into nerve impulses which travel along the auditory nerve to the brain stem (which decodes duration and intensity of sound) then to the auditory cortex which recognises the sound and may form an appropriate response to that sound. Broca’s Area is generally considered to be the main centre of speech production. The neuroscientist after whom this brain area is named found that patients with speech production problems had lesions (damage) to this area in their left hemisphere but lesions in the right hemisphere did not cause this problem. More recent research indicates Broca’s area is also involved with performing complex cognitive tasks (e.g. solving maths problems). Wernicke’s area is also in the left hemisphere and is concerned with speech comprehension. The neuroscientist after whom this brain area is named found that lesions in this brain area could produce but not understand/comprehend language. Wernicke’s area is divided into the motor region (which controls movements of the mouth, tongue and vocal cords) and the sensory area (where sounds are recognised as language with meaning). Broca’s and Wernicke’s areas are connected by a loop which ties together language production and comprehension. Equipotentiality theory argues that although basic brain functions such as the motor cortex and sensory functions are controlled by localised brain areas, higher cognitive functions (such as problem-solving and decision-making) are not localised. Research has found that damage to brains can result in other areas of the brain taking over control of functions that were previously controlled by the part of the brain that has been damaged. Therefore, the severity of brain damage is determined by the amount of damage to the brain rather than the particular area which has been damaged. The way in which brain areas are connected with each other may be as important for normal cognitive function as particular brain sites themselves. Brain sites are interdependent and damage to connections between sites may lead to the brain site not being able to function normally. For example, Dejerine (1892) found that damage to the connection between the visual cortex and Wernicke’s area lead to an inability to read (vision + comprehension). Gender differences have been found with women possessing larger Broca’s and Wernicke’s areas than men, presumably as a result of women’s greater use of language. Hemispheric lateralisation concerns the fact that the brain’s 2 hemispheres are not exactly alike and have different specialisms. For example, the left hemisphere is mainly concerned with speech and language and the right with visual-motor tasks. Broca (1861) found that damage to the left hemisphere led to impaired language but damage to the same area on the right hemisphere did not. The brain’s 2 hemispheres are connected by a bundle of nerve fibres – the corpus callosum – which allows information received by one hemisphere to be transferred to the other hemisphere. Investigations into the corpus callosum began when doctors severed patients’ corpus callosum in an attempt to prevent violent epileptic seizures. Sperry (1968) tested such split-brain patients to assess the abilities of separated brain hemispheres. Aim: To assess the abilities of separated brain hemispheres. Participants sat in front of a board with a horizontal rows of lights and were asked to stare at the middle point. The lights then flashed across their right and left visual field. Participants reported lights had only flashed up on the right side of the board. FindingsWhen their right eye was covered and the lights were flashed to the left side of their visual field they claimed not to have seen any lights at all. However, when asked to point at which lights had lit up they could do. ConclusionThis shows that participants had seen the lights in both hemispheres but that material presented to the left eye could not be spoken about as the right hemisphere (which receives information from the left eye) has no language centre and thus cannot speak about the visual information it has received. It can communicate about this in different non-visual ways, however – e.g. participants could point at what they had seen. This proves that in order to say that one has seen something the region of the brain associated with speech must be able to communicate with areas of the brain that process visual information. Because split-brain patients are so rare, findings as described above were often based on samples of 2 or 3, and these patients often had other neurological problems which might have acted as a confounding variable. Also, patients did not always have a complete splitting of the 2 hemispheres. These factors mean findings should be generalised with care. More recent research has contradicted Sperry’s original claim that the right hemisphere could not process even basic language. For example, the case study of JW found that after a split-brain procedure he developed the ability to speak out of his right hemisphere which means that he can speak about information presented to either his left or his right visual field. Brain lateralisation is assumed to be evolutionarily adaptive as devoting just one hemisphere of the brain to tasks leaves the other hemisphere free to handle other tasks. For example, in chickens, brain lateralisation allows birds to use one hemisphere for locating food, the other hemisphere to watch for predators. Thus, brain lateralisation allows for cognitive multi-tasking which would increase chances of survival. Individuals with high level mathematical skills tend to have superior right hemisphere abilities, are more likely to be left handed, and are more likely to suffer allergies and other immune system health problems. This suggests a relationship between brain lateralisation and the immune system. Research also indicates that the brain become less lateralised as we age. It is possible that as we age and face declining mental abilities the brain compensates by allocating more resources to cognitive tasks. Plasticity refers to neurological changes as a result of learning and experience. Although this was traditionally associated with changes in childhood, recent research indicates that mature brains continue to show plasticity as a result of learning. Learning and new experiences cause new neural pathways to strengthen whereas neural pathways which are used infrequently become weak and eventually die. Thus brains adapt to changed environments and experiences. Boyke (’08) found that even at 60+, learning of a new skill (juggling) resulted in increased neural growth in the visual cortex. Kuhn (’14) found that playing video games for 30+ minutes per day resulted in increased brain matter in the cortex, hippocampus and cerebellum. Thus, the complex cognitive demands involved in mastering a video games caused the formation of new synaptic connections in brain sites controlling spatial navigation, planning, decision-making, etc. Davidson (’04) matched 8 experienced practitioners of Tibetan Buddhist meditation against 10 participants with no meditation experience. Levels of gamma brain waves were far higher in the experienced meditation group both before and during meditation. Gamma waves are associated with the coordination of neural activity in the brain. This implies that meditation can increase brain plasticity and cause permanent and positive changes to the brain. Kempermann (’98) found that rats housed in more complex environments showed an increase in neurons compared to a control group living in simple cages, Changes were particularly clear in the hippocampus – associated with memory and spatial navigation. A similar phenomenon was shown in a study of London taxi drivers. MRI scans revealed that the posterior portion of the hippocampus was significantly larger than a control group, and size of difference was positively correlated with amount of time spent as a taxi driver (i.e. greater demands on memory = more neurons in this portion of hippocampus). Functional recovery refers to brain functions moving from a damaged to an undamaged location after traumatic brain injury. Case studies of stroke victims who have experienced brain damage and thus lost some brain functions have shown that the brain has an ability to re-wire itself with undamaged brain sites taking over the functions of damaged brain sites. Thus, neurons next to damaged brain sites can take over at least some of the functions that have been lost. Functional recovery is an effect of brain plasticity which is thought to operate in 2 main ways. Neuronal unmasking. Wall (’77) noticed the brain contained ‘dormant synapses’ – neural connections which have no function. However, when brain damage occurs these synapses can become activated and open up connections to regions of the brain that are not normally active and take over the neural function that has been lost as a result of damage. Stem cells are unspecialised cells which can become specialised to carry out different types of task: for example, taking on the behaviour of neurons in the brain. Current research is examining ways in which stem cells might be used to aid recovery from brain trauma: for example, they could be implanted to replace dead cells or to release substances which encourage growth or recovery of damaged cells. There is a negative correlation between functional recovery and age: i.e. young people have a high ability to recover which declines as we age. Level of education (associated with a more active, neurologically well-connected brain) is positively correlated with speed of recovery from traumatic brain injuries. Schneider found that patients with a college education were x7 times more likely to than those who did not finish college to recover from their disability after 1 year. A brain scanner which measures increased blood flow to brain sites when individuals are asked to perform cognitive/physical tasks. Increased blood flow indicates increased demand for oxygen in that area. Thus, fMRI can help build up a map of brain localisation. For example, an fMRI scan could identify brain sites which received increased oxygen when a participant is asked to solve maths problems. •	fMRI is a non-invasive technique and does not expose the brain to potentially harmful radiation. •	fMRI only measures blood flow – it does not directly measure neural activity and is not, therefore, a totally objective measure of neural activity in the brain. •	fMRI may overlook the interconnectivity of brain sites. By only focusing on brain sites receiving increased blood flow, it fails to account for the importance of brain sites connecting/communicating with each other. Measures electrical activity in the brain using electrodes attached to the scalp, and measures how electrical activity in the brain varies over time/in different states (e.g. waking vs. asleep). EEG readings can detect epilepsy and Alzheimer’s. 4 basic brain wave patterns are (i) alpha – awake and relaxed, (ii) beta – awake and highly aroused or in REM (rapid eye movement sleep), (iii) delta – deep sleep, (iv) theta – light sleep. •	Records brain activity over time and can, therefore, monitor changes as a person switches from task to task or one state to another (e.g. falling asleep). •	EEGs have medical applications in diagnosing disorders such as epilepsy and Alzheimer’s. •	EEGs only monitor electrical activity in outer layers of the brain, therefore, cannot reveal electrical activity in deeper brain sites. •	Not highly accurate – therefore cannot distinguish differences in activity between 2 closely adjacent areas. Measures small voltages of electrical activity when a stimulus is presented. Because these small voltages are difficult to pick out from other electrical signals in the brain, the stimulus needs to be repeatedly presented, and only signals which occur every time the stimulus is presented will be considered an ERP for that stimulus. ERPS are of 2 types: (i) sensory ERPS - those that occur within 100 milliseconds of stimulus presentation; (ii) cognitive ERPS – those that occur 100 milliseconds or more after stimulus presentation. Sensory ERPS indicate the brain’s 1st recognition of a stimulus. Cognitive ERPS represent information processing and evaluation of the stimulus. •	ERPS provide a continuous measure of neural activity in response to a stimulus. Therefore, changes to the stimulus can be directly recorded: e.g. if a blue coloured slide turned green. •	ERPS only monitor electrical activity in outer layers of the brain, therefore, cannot reveal electrical activity in deeper brain sites. Brains from dead individuals who displayed cognitive abnormalities whilst alive can be dissected to check for structural abnormalities/damage: e.g. Broca’s area was discovered after dissections of patients who displayed speech abnormalities, and HM’s (Memory Topic) inability to store new memories was linked to lesions in his hippocampus. Neurological abnormalities have been linked to depression, schizophrenia, anti-social personality disorder, etc. •	Allow for detailed examinations and measurement of deep brain structures (e.g. the hypothalamus) not measurable by brain scans. •	Various factors can act as confounding variables and might confuse findings/conclusions. For example, length of time between death and post-mortem, other damage caused to the brain either during death or as a result of disease, age at death, drugs given in months prior to death, etc. The physiological processes of living organisms follow repetitive cyclical variations over certain periods of time. These bodily rhythms have implications for behaviour, emotion and mental processes. Endogenous pacemakers (EP’s). Internal biological structures that control and regulate the rhythm. Exogenous zeitgebers (time givers) (EZ’s). External environmental factors that influence the rhythm. Heart rate, metabolic rate, breathing rate and body temperature all reach maximum values in the late afternoon/early evening and minimum values in the early hours of the morning. If we reverse our sleep-waking pattern these rhythms persist. This indicates human bodies are evolved for activity in the day and rest at night and, indeed, being nocturnal or disrupting the circadian cycle is highly stressful and physiologically and psychologically harmful. The EP controlling the sleep-waking cycle is located in the hypothalamus. Patterns of light and darkness are registered by the retina, travel up the optic nerves to where these nerves join (optic chiasma), and then pass into the superchiasmatic nucleus (SCN) of the hypothalamus. If this nerve connection is severed circadian rhythms become random. The same effect is produced by damaging the SCN of rats, and people born without eyes cannot regulate bodily rhythms. Ralph bred a group of hamsters to follow a (shortened) 20-hour circadian cycle. SCN cells were removed and transplanted into the brains of rat foetuses with normal rhythms. Once born, these rats adopted a 20-hour cycle. Their brains were then transplanted with SCN cells from 24-hour cycle hamsters and within a week their cycles had adopted this new 24 cycle. When cells from the SCN were removed from rats the 24-hour cycle of neural activity persisted in the isolated cells. Recent research by Yakazaki found that isolated lungs and livers, and other tissues grown in a lab still persist in showing circadian rhythms. This suggests cells are capable of maintaining a circadian rhythm even when they are not under the control of any brain structures and that most bodily cells are tuned in to following a daily circadian rhythm. All of this evidence points to the fact that circadian rhythms are primarily controlled by evolutionarily-determined, biological structures that exert a strong influence on us to maintain normal sleep-waking patterns. However, circadian rhythms are also influenced by EZ’s - ‘cues’ in the environment- about what time of day or night it is. In 1975 Siffre spent 6 months underground in an environment completely cut off from all EZ’s. Although he organised his time in regular patterns of sleeping and waking his body seemed to have a preference for a 25 hour rather than a 24-hour cycle. This implies that circadian rhythms are mainly controlled by EP’s rather than EZ’s. Another piece of evidence in support of this idea is that Innuit Indians who live in the Arctic Circle inhabit an environment that has hardly any darkness in summer and hardly any light in winter. If the sleep-waking cycle was primarily controlled by EZ’s they would tend to sleep a huge amount in winter and hardly at all in summer. However, this is not the case - they maintain a fairly regular pattern of sleeping and waking all year around. With the development of certain scientific equipment, it became possible to study sleep more objectively. •	The electroencephalogram (EEG) measures electrical brain activity. •	The electrooculogram (EOG) measures eye movement. •	The electromyogram (EMG) measures muscle tension. These instruments indicate that during a single night’s sleep we experience a cyclical ultradian rhythm of different stages and types of sleep which can be roughly divided into REM (rapid eye movement) and NREM (non-rapid eye movement). REM is strongly associated with dreaming: for example, 80% of sleepers awoken from REM will report that they have been dreaming, whilst the NREM rate is only 15%, and dreams from NREM are reported as less vivid and visual. NREM can be sub-divided into stages 1-4. Once asleep we enter stage 1 NREM then, over the next half-hour, rapidly descend through stages 2, 3 and 4. As we descend through the stages muscles progressively relax, EEGs become less active, pulse, respiration and blood pressure become slower, and it is progressively more difficult to wake the sleeper. After spending about 30 mins in stage 4 NREM the cycle reverses and we ascend back through the NREM stages 3, 2 and 1. However, instead of waking up we enter our 1st period of REM sleep. During REM, pulse, respiration and blood pressure increase but become less regular and EEG’s resemble those of the waking state - showing the brain to be highly active in terms of blood flow, oxygen consumption and neural firing. Major characteristics of REM are that behind the closed lids the eyeballs show rapid movement and the brain shows spontaneous activity that is strongly associated with the experience of dreaming. Firstly, hindbrain and midbrain structures normally associated with relaying visual and auditory stimuli from the outside world spontaneously generate signals: i.e. the brain is acting as if it is hearing and seeing things. Secondly, the motor cortex (responsible for bodily movement) spontaneously generates signals but these are ‘cut off’ at the top of the spine, limb commands are blocked, and we are effectively paralysed from the neck down. As stated earlier it is generally assumed that we almost exclusively dream in REM and that NREM is not associated with dreaming. It is possible that we dream in both NREM and REM, but we don’t recall dreams from NREM as we are more ‘deeply’ asleep in this state and dream memories cannot be recalled. Patterns of NREM and REM alter as we age. •	New-born - 16 hours’ sleep, 50% REM (patterns of REM are observed in foetuses). •	3-year-old - 12 hours’ sleep, 25% REM. •	Adult - 8 hours’ sleep, 22% REM. •	70+- 6 hours’ sleep, 14% REM. This changing pattern of REM has led researchers to believe one function of REM is the growth and repair of the brain - needed a lot when young and less as we age. The EP controlling REM appears to be the locus coeruleus (LC) (a patch of cells located in a brain structure called the pons) which produces noradrenaline and acetylcholine. Destruction of the LC causes REM to disappear. If neurons in a different part of the pons are destroyed, REM remains but muscle paralysis in REM disappears- this results in a cat moving around although it is completely asleep. This may lie behind ‘behavioural sleep disorder’ in humans where sleepers may act out their dreams. Exogenous zeitgebers (time-givers) (EZ’s). External environmental factors that influence the rhythm. The EP controlling the sleep-waking cycle is located in the hypothalamus. Patterns of light and darkness are registered by the retina, travel up the optic nerves to where these nerves join (optic chiasma), and then pass into the suprachiasmatic nucleus (SCN) of the hypothalamus. If this nerve connection is severed circadian rhythms become random. The same effect is produced by damaging the SCN of rats, and people born without eyes cannot regulate bodily rhythms. However, circadian rhythms are also influenced by EZ’s - ‘cues’ in the environment - about what time of day or night it is. Siffre spent 6 months underground in an environment completely cut off from all EZ’s. Although he organised his time in regular patterns of sleeping and waking his body seemed to have a preference for a 25 hour rather than a 24-hour cycle. This implies that circadian rhythms are mainly controlled by EP’s rather than EZ’s. Another piece of evidence in support of this idea is that Innuit Indians who live in the Arctic Circle inhabit an environment that has hardly any darkness in summer and hardly any light in winter. If the sleep-waking cycle was primarily controlled by EZ’s they would tend to sleep a huge amount in winter and hardly at all in summer. However, this is not the case- they maintain a fairly regular pattern of sleeping and waking all year around. Disruption of the circadian sleep-waking cycle (e.g. jet lag and shift work) has been shown to cause negative physical and psychological effects. Jet Lag occurs when we cross several world time zones quickly. Circadian rhythms will be disrupted as although our endogenous pacemakers stay the same, the exogenous zeitgebers (patterns of light and dark in the new environment) have changed. For example: Flying from London to New York. Leave London 8 a.m. - spend 8 hours flying – arrive NYC 4 p.m. Although our endogenous pacemaker ‘feels’ as though it is 4 p.m., we must take account of the fact that NYC is 5 hours ‘behind’ London time. When we arrive in NYC it will in fact be 11 a.m. (4 p.m. minus 5 hours). Therefore, our endogenous pacemaker has become desynchronised with the local exogenous zeitgebers. The effect of this is that we will have an artificially lengthened day. For example, we may be ready to sleep by 6 p.m. NYC time, and after 8 hours’ sleep might wake up at 2 a.m. ready to start a new day. The overall effect of crossing time zones in this manner is that our body will feel as if it is daytime during the night, and that it is night-time during the day. The more time zones we travel through the more severe this effect will be. The symptoms of Jet Lag are normally described as more severe when travelling in a West-East direction (e.g. from NYC to London). When we travel in an East-West direction the day is lengthened. As the Siffre study proves, our body has a preference for a longer 25-hour circadian rhythm, and thus prefers a lengthened to a shortened day (as occurs when we travel West-East).